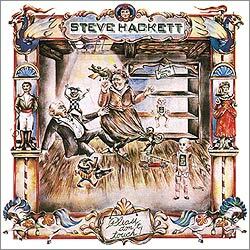 In May 1978 Steve Hackett released Please Don’t Touch, his second solo album and his first after he left Genesis. Like Peter Gabriel on his debut Steve wanted to include as many musical styles as possible and create a crossover from white and black music. He therefore recorded one half of the album in the UK and the other half in the United States. The watercolor painting Steve’s then wife Kim Poor provided for the cover is among the ones with the most attention to details and one of the most beautiful she has ever created for an album of Steve’s. As with Paul Whitehead’s Genesis cover paintings fans can pore over the details and wonder what they are supposed to mean and what their relation to the music could be. 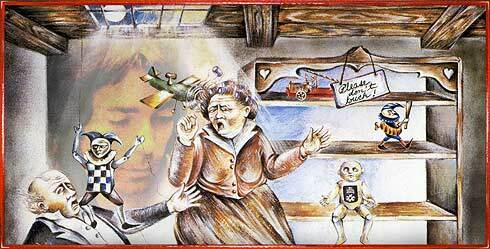 The painting shows an elderly couple in Victorian clothes who are attacked by wind-up dolls, small robots and other toys. Around this central image there is a kind of wooden frame with more dolls, rocking-horses and other ornaments. At the bottom of the frame (and on the knob of a cupboard in the picture) there is a sign “Please Don’t Touch”. Kim Poor had the idea for this painting in a shop in Portobello Road, London, that sold old Victorian automats and toys. The album cover allegedly inspired Ridley Scott to the scene in his famous film Bladerunner in which toys become alive and attack the character portrayed by Harrison Ford. It is hard to say what the cover design and the album title are supposed to tell us. Please Don’t Touch is no concept album like its predecessor, Voyage Of The Acolyte, and the song lyrics have not got any apparent relation to the cover either. It occurred to me that the title describes Steve’s artistic freedom as an invididual artist. He was frequently frustrated in Genesis when the band did not use his song ideas as he intended them to, but changed them, tore them apart, joined them with other elements and generally changed them. When he talked about this in a music magazine shortly after he had left Genesis the headline read “Genesis slaughtered my songs!” That was now a thing of the past. Only he himself would chance his musical ideas, for all others it was “Please Don’t Touch!” Who knows what happens to those who still do. Perhaps someone has fiddled too long with all the wind-up dolls and robots on the album cover – until they turned around and attacked. The back of the LP cover shows a black-and-white photo of Steve standing in a leather coat on the shore. The album also sports a lovingly designed extra sheet with the lyrics and the credits. On its back there are colour photos Armando Gallo took of the band and the recording sessions. Many of these beautiful details had been left off the first CD version of the album. The 2005 remaster fortunately includes all the artwork. It still looks best on a vinyl cover, though. Steve Hackett – electric and acoustic guitars, Roland GR-500 guitar synthesizer, vocals, keyboards, percussion, musical box, mellotron, psaltery, maraccas and everything else he could get hold of at the time (a complete list of equipment is included in the vinyl and the 2005 remaster CD booklet). The album begins with a clear, merry riff on the acoustic guitar that goes on all through the song and is extremely catchy. Later a second acoustic guitar and an electric guitar in Hackett’s typical style come in. The opening song of Please Don’t Touch is heavy in guitars, but catchy and has good potential as a radio single. Narnia was, in fact, scheduled as a single release, and the song received lots of airplay on American radio stations. Unfortunately the record company of Kansas, whose singer Steve Walsh and drummer Phil Ehart sang and drummed on this song, vetoed the single. 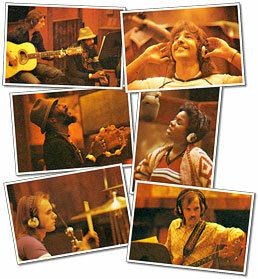 Promo singles were produced of an alternate version with John Perry on vocals, but it was not as strong as the recording with Walsh, so that the idea of a Narnia single was scrapped. The Perry version of Narnia was released in 2005 as a bonus track of the remaster edition. The musical inspiration for the song came to Hackett through the saxophone player Ian McDonald. He [McDonald] played him a brief instrumental shortly after he had left King Crimson in the early 70s and said that that would be a good intro for a song. A couple of years later Steve decided that that was a good idea. The lyrics are based on The Lion, The Witch And The Wardrobe, the first volume of the Narnia Chronicles by C.S.Lewis. The song was played a lot on the Spectral Mornings tour, but it did not turn into a long-time live favourite. The second song shows Hackett’s humour. A colourful sequence of instruments and sounds leads the listener into the world of Agatha Christie. The song is a tribute to the British author and tells many possible and impossible methods how you can be murdered. The song begins with the sound of an musical box, a female voice says something unintelligible before a choir comes in that seems to sing a Christmas carol. Finally the song really starts with glockenspiel and guitar arpeggios, a loud church organ (the Robert Morton pipe organ was destroyed by a fire in the Record Plant studio in L.A. before the album came out), and drums and bass combine to a quick beat. A piano and electric guitars come in before a squeaking barrel organ brings the song to an end. The ‘mini-musical’ is sung by Steve Hackett who otherwise sings only backing vocals on the album. Apparently Steve was not as confident about his singing qualities back then, so he distorted his voice with a “laughing gnome” effect (the voice is simultaneously pitched higher and lower). Only at the end of the song does he replace the distortion with lots of echo. These effects lend a particularly funny note to what already is a bizarre track in the first place. Its charme reminds of older humorous Genesis songs like Harold The Barrel or Willow Farm. The song was played live on the Spectral Mornings tour which perhaps led to exhilaration instead of musical edification on the part of the audience. Carry On Up The Vicarage is so merry and funny that one almost gets the impression that murder and manslaughter were entertaining pastimes. Racing In A is the fastest and rockiest number of the album. Phil Ehart’s driving beat keeps changes the signature several times, but the song stays rocky and catchy and full of drive (beware – the author of these lines got a speeding ticket while this song was on). Steve Walsh provides the lead vocals again, and he really gets into the song. There is little keyboard in the song (mainly choirs and strings) and the electric guitars dominate the sound. Though this is too complex for the radio, it is a song that urges the listener to dance to it. Rarely has Hackett delivered such a straight rock song with many fast distorted guitar riffs. After 3:50 the rock part is suddenly over and the nylon guitar plays a rather classical finale. A peculiar ending for a rock song, but then we are talking about Steve Hackett, and you never know which stylistic device he will use next. Despite the radical contrast between the two song parts Steve manages to keep the song together (which is something has not always succeeded in). The lyrics are about an escape from the strain of everyday life, taking the car and relaxing in the country-side with your friends. A feel-good song. Racing In A received frenetic applause during the Spectral Mornings tour; the song was extended to more than ten minutes at times (as a medley with parts of Ace Of Wands). The coda on the acoustic guitar was usually only played after the applause for the rock part. After so much uptempo things calm down all of a sudden with Kim; the listener is invited to lean back and dream. Steve dedicated this brief instrumental piece (only himself playing the nylon guitar and brother John on the flute) to his then wife Kim Poor. The piece proves (if proof were still needed after Hands Of The Priestess on the album before) how much the Hackett brothers love classical music. The influence of Eric Satie with whose oeuvre Steve and John would study closely later is particularly obvious. One could almost think that Kim was one of Satie’s famous Gymnopédies. Kim is performed with much discipline, precise notes and free from superfluous frills. All this lends a comfortable calm with which the song captures the listener. This musical gem was a staple at Steve’s acoustic shows for decades until he split up with Kim Poor. The version on There Are Many Sides To The Night is particularly interesting because Kim is played with switched roles: Steve plays the flute melody on the guitar while Julian Colbeck plays the guitar parts on the piano. How Can I? introduces another musical style. Hackett shows that he can play folk ballads, too. The main instruments in the song are Hackett’s chords on the acoustic guitar and the characteristic deep voice of Woodstock veteran Richie Havens. Hackett and Havens met in 1977 at Earls Court where Havens opened for Genesis. Steve wanted to work with him and invited him to dinner. Fortunately, Havens was also interested in a cooperation and brought up the topic. The outcome were the songs How Can I? and Icarus Ascending. How Can I? was released as a single (backed with Kim), and they even shot a video with Steve and Richie sitting opposite each other while Steve plays the guitar and Richie sings. The song has oven been described as a companion piece to Peter Gabriel’s Solsbury Hill, but it is calmer, more solemn and feels more like camp fire music instead of a dance number. Havens’ soulful voice and the folk elements make it sound very American. This creates a strong contrast to the previous pieces that sounded very British and European. How Can I? sounded American, but Hoping Love Will Last moves a lot further down the road into the music of the New World. In fact, Hackett presents a flawless piano blues ballad. Such a song requires a soulful black voice. Steve found it in a bar in Chicago when he saw a performance by an artist called Randy Crawford, who was still quite unknown then – her breakthrough with The Crusaders came shortly afterwards, though. He was very attracted to her strong soul voice with the quick vibrato. Parts of the song were recorded in Los Angeles, others in London, and this actually led to Randy’s first release in the UK. The song begins with the familiar sound of Steve’s electric guitar and some acoustic guitar. The first instrument is played with a volume pedal so one does not hear the strokes and suspects this to be keyboard. Then the piano, brushed drums and Randy’s mellow voice come in. The guitars move to the background and offer subtle accents. After a brief intermezzo of electric guitar and mellotron strings Randy unveils her full vocal power and sings the rest of the song with a voice full of intense passion. What a great voice! Now that is what I call a soul ballad! The drums become stronger, so does Steve’s guitar, but Randy Crawford is always in the fore. Steve has said about the song: “I felt it was the kind of song that I wanted to do that could become a standard, that even Frank Sinatra could sing.” It is left to the listener to decide whether he achieved that. The song is definitely a special one in Steve’s works. Unless you actually know it, or if it were not for the distinctive sound of the electric guitar nobody would guess that Hoping Love Will Last was written by an (ex-) member of Genesis. Tony Banks praised the song in Chapter & Verse. He felt that it would have been good on A Trick Of The Tail. Whether Phil Collins as a singer could have lent the same class to the song as Randy Crawford did so impressively may be doubted at the very least. Steve, for one, felt that Genesis could not pull off this song. The next three pieces, Land Of Thousand Autumns, Please Don’t Touch and The Voice Of Necam are a musical unity, but they will be reviewed individually here. The singing guitar sound at the end of Hoping Love Will Last moves on seamlessly into Land Of Thousand Autumns. The keyboard already threatens with the motive of Please Don’t Touch along with some atmospheric sounds and a bit of acoustic guitar. The piece is not really autonomous, but simply a prelude to the title track. The original CD release has a two second gap between both instrumentals. This flaw was fortunately corrected in the 2005 remaster version. Steve Hackett gives out these directions/warnings on the back of the Please Don’t Touch LP. If you would like to avoid legal confrontations with your neighbours you are well advised not to follow this recommendation too often. If the neighbours are away and the structural designers do not object one simply has to try it out, it’s so much fun. Fans of pleasant Hackett sounds à la Spectral Mornings will find the title song a challenge at least, if not an outright impudence. No, Please Don’t Touch does not want to sound pretty. This unruly monsters shows its claws and fangs, spread its poison, spits at the listener and makes them sleep bad at nights! The song is driven by a bass pedal that waltzes everything down – John Hackett does not play it with his feet, but hammers on it with his fists. Steve makes his guitar howl loudly on top of it. A second, strummed guitar can be heard in the background. Hypnotic keyboards and Chester Thompson’s driving drum beat help to create a nightmare-ish atmosphere right out of a horror or science-fiction film. Hackett shows his real prog side for the first time on the album – and it is obvious that he likes the early King Crimson a lot. Rhythm and topic of the piece change. After a hideous guitar riff the beast suddenly become friendly (it just wants to play…) and Steve and John play a merry tune as duet of flute and electric guitar (a bit like Jacuzzi) as a marked contrast to the rest of the piece. In the end the beast turns angry again and returns to the basic theme. 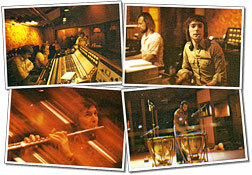 Steve had wanted to include Please Don’t Touch on Genesis’ Wind & Wuthering. The band rehearsed it but then the others rejected it to Steve’s frustration. When Phil Collins, who had stated he could not get behind the piece, heard the finished album version he declared he was very impressed with it. 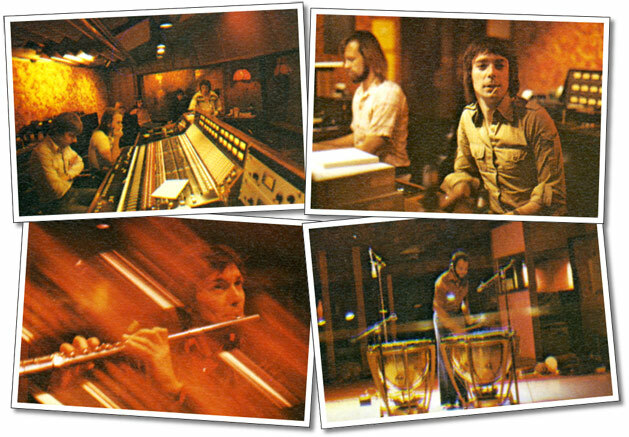 It seems that the album version was a lot different from the one Genesis rehearsed and which Phil had played with a Weather Report-style rhythm. Please Don’t Touch (frequently surrounded by Land Of Thousand Autumns and The Voice Of Necam) has become the second real live classic from the album (the other one being Kim) and it is still played on electric band shows. The title track ends suddenly, but the motive is continued by The Voice Of Necam – on a barrel organ accompanied by whirs and steam noises, as if the Victorian robots and doll from the album cover began moving and making these sounds. All of a sudden the voice of Necam the computer comes in and grows louder – an ethereal and synthetic choir that pushes all other instruments aside until Steve’s acoustic nylon guitar comes in and plays a calm, almost classical motive with Necam. This helps the listener to calm down and relax after the electric tour de force of the title song. The calm that The Voice Of Necam offers is soon over. The last song on the album tears the listener from his comfortable numbness. Icarus Ascending comes in all of a sudden with power chords on the piano , various keyboards, bass and an almighty drumkit. Richie Haven’s strong voice towers on top of this rich structure of sounds. Whereas he sounded romantic on How Can I? he chooses to give us a taste of how strong yet moving his voice is. The song has a beautiful, catchy, romantic melody and would be perfect for the radio in a slightly edited version. In the middle of the song the arrangement suddenly dissolves completely. Bass and piano play solos on top of a slow keyboard arpeggio, and it sound a bit like a jazz bar before the theme of the song returns, the guitar continues the arpeggio and Richie sings the final verse. The end of the song is protracted, Richie sings lots of “uuh-uhh”s in a majestic voice. He is accompanied by choirs, a flute solo by John and a rich ensemble of instruments, amongst them an old psaltery. The elegiac end of the song seems out of this world and invites the listener to close their eyes and dream. A wonderful ending for a fantastic album. The lyrics are about the Greek myth of Icarus who escaped from the maze of the Minotaur with artificial wings. He came too close to the sun, though, and the wax in his wings melted so that he fell to his death. The song ends on a more optimistic note: “All that's behind me, And I flew this time, Never falling, Since your eyes first touched mine”. I have always read the lyrics as a metaphor for Steve’s departure from Genesis and the full focus his solo career. Had he bitten off more than he could chew? Would he be able to make it without the safe haven of Genesis? Or would he fail and his solo career plummet like Icarus? Steve apparently answered these questions with the last lines from Please Don’t Touch. Time has done her share. More than thirty years after he has left Genesis Steve Hackett has not fallen down. He still soars. Please Don’t Touch offers an enormous variety of different musical styles, from pop and rock to folk, soul and classical music to prog. Bringing all these style together in such a way that the outcome is one coherent album and not just a couple of different songs lumped together is quite a feat. The combination of various musical styles on one album has become a trademark of Steve Hackett’s, particularly on his recent rock albums To Watch The Storms and Wild Orchids. He has never again achieved such a harmony between the musical styles as on Please Don’t Touch. Despite the enormous contrasts (who would have guessed that Kim, Hoping Love Will Last and Narnia are all by the same composer and musician?) one can enjoy this album in one go. The stylistic breaks may surprise the listener at first, but they do not disrupt the flow because recurring sounds (e.g. Steve’s singing guitar, the nylon guitar or the Necam choir) and fluent transitions between songs (e.g. between Hoping Love Will Last and Land Of Thousand Autumns) provide cohesion. The quality of the songs and instrumentals is good to excellent throughout; there is not a single failure on this album. The number of songs on this album is unusually high (six out ten tracks are songs); most of them are quite catchy, some even have radio potential (Narnia could have been a hit!) so that the listener is not overtaxed with the musical variety of the album. The LP went to #38, so it actually made the UK Top 40. John Acock and Steve Hackett have done a good job in producing the album. The sound is clear and brilliant where it is required and it has enough oomph and power on the rock pieces. It is particularly good the note that the guitars, too often smothered under Banks’ keyboard blankets, can finally be heard clear and strong without forcing themselves to the fore. Many Genesis fans would have wished to have this sound on Wind & Wuthering. It was a good decision to have mainly guest singers. 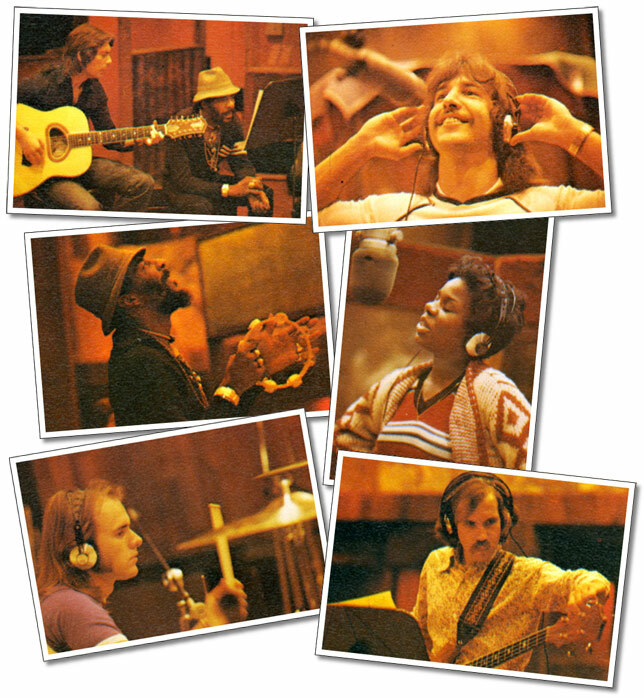 Steve Walsh, Randy Crawford and Richie Havens are three excellent singers that lend a special quality to the songs. When really good singers perform Hackett’s songs his enormous song writing talent is revealed. Though I like Steve’s singing and though I love many of the songs he sings on, I would not like to imagine what Icarus Ascending or Narnia would have sounded like with Steve’s vocals. These songs are simply too good with the guest vocalists!